I liked the idea of this lovely yellow with the grey and white and decided to make this 20 inch plate to use bring them together. It's fused at a high temperature and has a smooth finish which looks looks quite cool I think. This lovely colour is called Lemongrass, teamed up here with a subtle patterned glass which mixes cobalt blue and soft white on a blue base. BTW, the edges are wavy on purpose to show more of the blue colour and just for fun! Little shards of lemongrass, sparkly black and mariner blue are quite striking on this small bowl. This came out so much cuter than I expected! Little chips of orange, green, teal and sea green in a little 10x10 bowl. 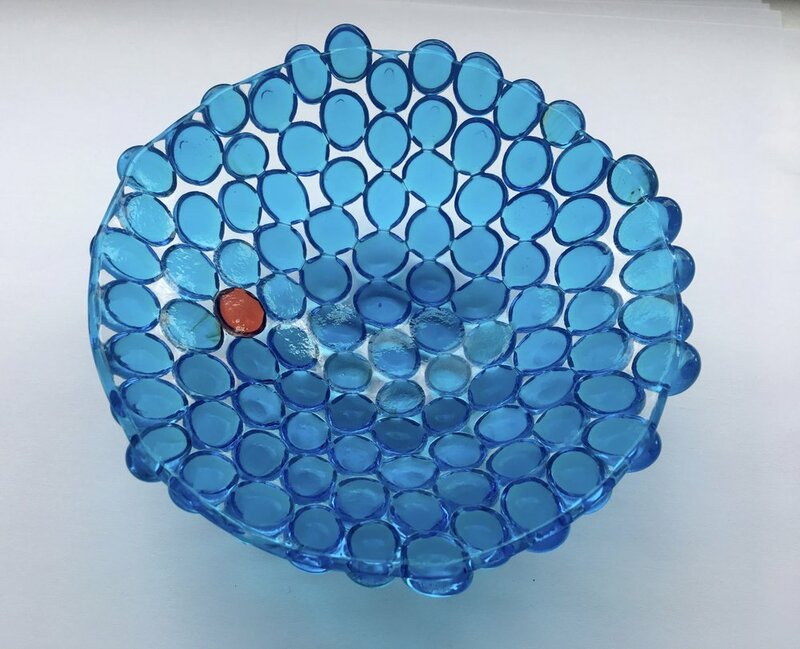 Talking of Brights, look how great this little bowl from the Flow range looks on a sunny windowsill! These little sticks are called stringers and they are also made of glass. I thought to use them as a nice contrast with the yellow, used here as a soap dish. This isn't an opaque yellow, but a transparent on a white background, which I wanted to use to contrast with this unusual purple striped glass which I only had a tiny bit of. I like the look & like the bubbles showing underneath too. This lovely red and blue glass is special edition 'Spirit Glass', it's so fab. Though it's opaque it goes so well with this Dark Blue transparent on a white background. I only had a small piece, but have ordered more for a big dish, coming soon! 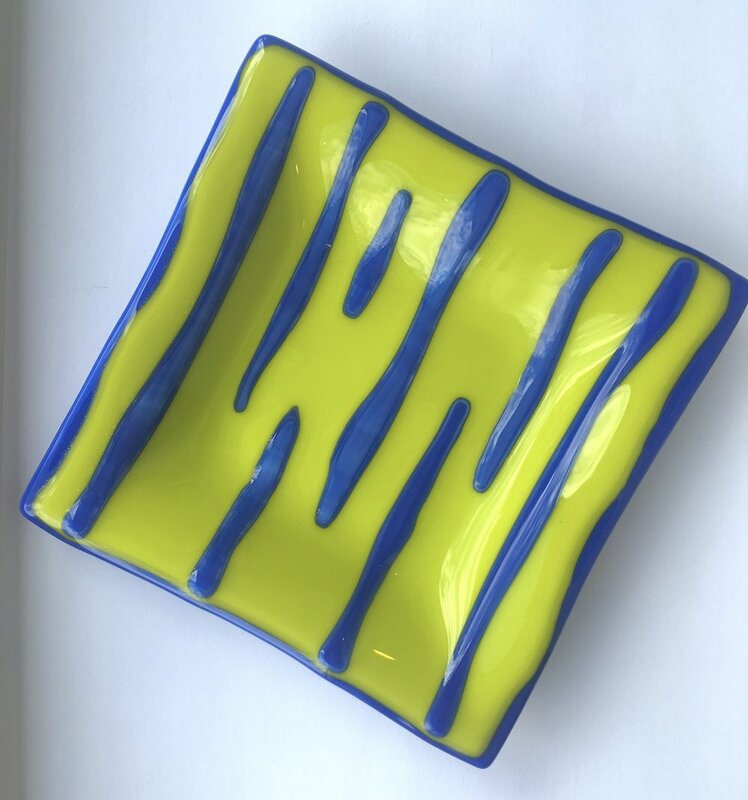 Crazy sort of Mondrian style dish in fabulous zingy colours. Great in the sun, stylish, but not quite as mad without! I really like this combo too with a pop of orange. Talking of pops of orange. These little fellas are called Pebbles. I like the way the work with their texture retained on the underside of this little bowl. 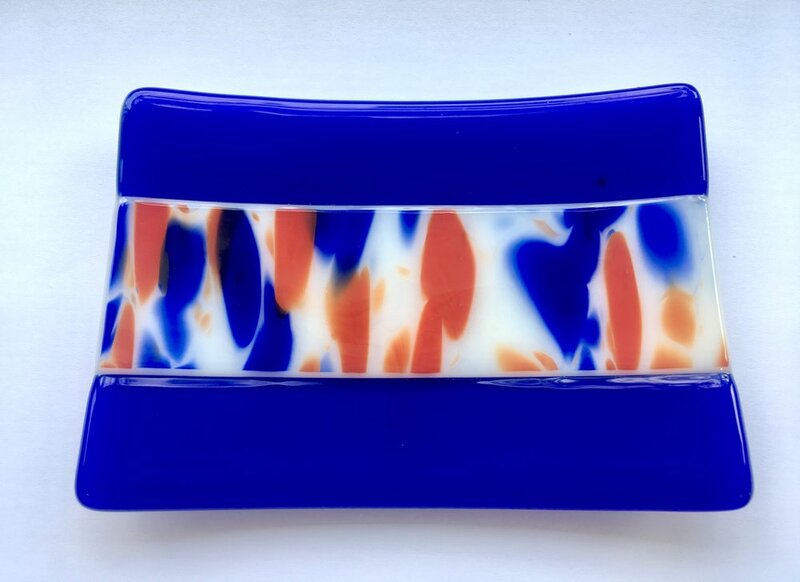 There is a mind boggling array of delicious colours in both opaque and transparent glass, which of course is what makes fused glass SO much fun! I've been enjoying playing around with the colours to see about their potential for a new design collection. Here are some of the ones I really like!